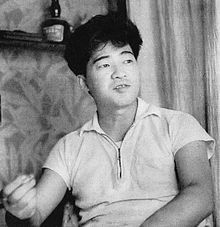 Kimifusa Abe (安部 公房) (March 7, 1924 – January 22, 1993) was a Japanese writer, playwright, photographer and inventor who wrote under the pseudonym of Kōbō Abe (安部 公房). His surreal, often nightmarish depictions of the modern condition have led him to often be compared to Franz Kafka. Abe won the Akutagawa Prize for The Crime of S. Karuma, the Yomiuri Prize in 1962 for The Woman in the Dunes, which was also made into an Oscar nominated film, and the Tanizaki Prize in 1967 for the play Friends. 砂の女 Suna no onna "Sand Woman"
The barrenness of sand, as it is usually pictured, was not caused by simple dryness, but apparently was due to the ceaseless movement that made it inhospitable to all living things. What a difference compared with the dreary way human beings clung together year in year out. He wanted to believe that his own lack of movement had stopped all movement in the world, the way a hibernating frog abolishes winter. Rarely will you meet anyone so jealous as a teacher. Year after year students tumble along like the waters of a river. They flow away, and only the teacher is left behind, like some deeply buried rock at the bottom of the current. Although he may tell others of his hopes, he doesn't dream of them himself. He thinks of himself as worthless and either falls into masochistic loneliness or, failing that, ultimately becomes suspicious and pious, forever denouncing the eccentricities of others. He longs so much for freedom and action that he can only hate people. When a castaway collapses from hunger and thirst it is fear of physical want rather than a real want, they say. Defeat begins with the fear that one has lost. More than iron doors, more than walls, it is the tiny peephole that really makes the prisoner feel locked in. It goes on, terrifyingly repetitive. One could not do without repetition in life, like the beating of the heart, but it was also true that the beating of the heart was not all there was to life. Only a shipwrecked person who has just escaped drowning could understand the psychology of someone who breaks out in laughter just because he is able to breathe. This page was last edited on 9 September 2018, at 18:03.